Squash House Quilts: Apron Madness and a Reminder…. First I wanted to remind you to suggest a name for my new bicycle to win the Swatches pattern and Chocolat fabric squares! You can either post a comment here or on my original post below. Deadline for entries is Friday Sept 26th! If you are a child of the 50’s, or were in high school or college in the 60’s, you probably wore an apron at one time or another. Well, women’s lib certainly changed that! The ‘liberated’ woman (from what she now wonders) I became in the late 60’s wouldn’t have been caught dead in an apron (and no – I didn’t burn either my bra or my apron)! Those times are indelibly etched on our lives, and thankfully we have moved on - aprons are no longer a symbol of a less-than-liberated life! I love them! Can’t buy enough patterns or fabric for them! This is one of my latest. I was going to make it for myself, but decided to give it as a gift. The pattern is by Lila Tueller. Her Woodland Bloom fabric wasn’t out when I was ready to sew it, so I made it from April Cornell’s Portugal line. If you purchase her pattern be sure to check out her website for a couple of corrections to the pattern. I also have her "Funked Out Peasant Blouse" pattern - just waiting on the Woodland Bloom fabric for it to arrive from Hancock’s! This woman is so talented - and nice! This is another one – reversible - which I made from a kit I purchased at Sew Expo. The designer actually provided pre-cut, tiny little strips so you could make your own little patchwork pieces. I wish I could remember her company name – I believe it was something like Hummer Dog Patterns. Here is another pattern/kit and a book of aprons. These make great Christmas gifts! Now that I've made myself dizzy with all the projects I need to do, I best go to bed! Amazing how things "old" are new again. Love aprons but must admit I don't wear them. I grew up learning to bake at my grandma's house. First rule: wash hands. Second rule: put on an apron (my grandmother's were rather large on me). Third rule: do NOT eat the raw cookie dough. When my grandma passed away 25 years ago I received 2 of my favorite things...one of her aprons and her cookie jar. I'm thinking about doing the DDIL one for Christmas. Super cute apron! It looks darling on you. Love it. 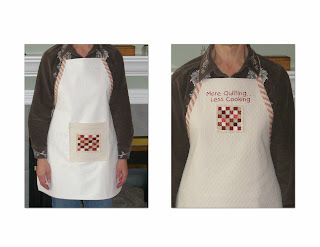 I have that last pattern on the bottom - the smock type apron. I have been wanting to make it. You are too cute!! I've got my Lilly Apron done and I try to wear it to Wal-mart as often as possible. It just makes the journey all the better. I'm so glad to know someone who is doing that Crabapple pattern below. I'm attempting the merry Christmas one. Wish me luck! !